A recent study found that a majority of kids wear shoes that are too small, which put them at risk for developing serious foot deformities, such as bunions. Here are some tips on buying athletic shoes for your child that fit! 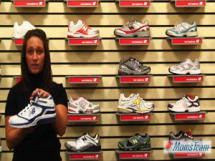 Replacing shoes and deciding whether they can be handed down to another child depends on the child's growth rate and the amount of shoe wear, says Alana Cioffi, Technical Field Representative and Training Coordinator at New Balance. 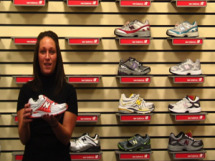 Tips on getting the best fit for athletic shoes from Alana Cioffi, Technical Field Representative and Training Coordinator at New Balance. Alana Cioffi, Technical Field Representative and Training Coordinator at New Balance, explains that the socks an athlete will wear playing sports should be worn when buying new shoes, not purchased afterwards. Because the mid-sole material of an athletic shoe takes a pounding and eventually loses its ability to provide your child's foot with adequate support or cushioning, replacing shoes when the mid-sole shoes wear or on a replacement schedule is important to preventing an overuse injury such as shin splints. Hand-me-down or used athletic shoes are not recommended for a number of reasons. Should Athletic Shoes Be Comfortable Right Away? When buying athletic shoes for their child, parents should expect the shoes to fit right away. It is a myth that athletic shoes need to be "broken in." For signs that a child's shoes are worn out and need to be replaced (as opposed to being too small for your child's growing feet), parents should check the bottom sole, mid-sole and sock liner.